Formula 3 - A Record of 500cc Racing by C.A.N. May 1951. Homepage. This page: Another 1951-dated flyer for a motor racing book, this one looking at 500cc Formula 3 cars. Formula 3 book by C.A.N. May. In all I have four old flyers promoting motor racing books produced by Foulis in 1951. 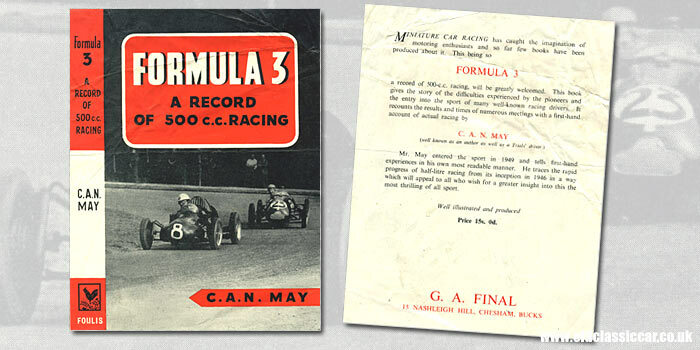 This, the third of these to be added to the site, is titled "Formula 3 - A Record of 500cc Racing" and follows on from "Split Seconds" (Raymond Mays) and "Racing a Sportscar" (Charles Mortimer). Two 500cc racing cars are shown battling away in a close-fought duel on the book's cover. Claude Austen Newton (C.A.N.) May was born into a family where motor-racing was already a feature in their life, and initiated his own route into the sport as a bouncer in a Wolseley Hornet, entered into a trial in 1933. He soon bought his own Wolseley, and then an MG, and became a successful trialist in his own right during the lead-up to WW2. He also competed at various sprint meetings, including, for example, the Whitchurch Speed Trials near Bristol. Following the war he wrote of his trialing exploits in two books, also by Foulis, namely Wheelspin and Wheelspin Abroad. Late in 1948 he bought the ex-Stirling Moss 500cc Cooper, with a view to entering Formula 3 races, and entered his first race with the car at Goodwood, in the Easter of 1949. In 1950 a newer MkIV Cooper was purchased, and success continued at both circuit and hillclimb meetings. It would be these experiences behind the wheel of a 500cc racing car that would provide the material used in this, the fifth motor racing book to be credited to his name. He would go on to race "500s" for several more years, his final outing being in 1956. Commentating kept him busy for a further three years, before a return to the tracks, in cars such as the Lotus 7 and the 18. Miniature car racing has caught the imagination of motoring enthusiasts and so far few books have been produced about it. This being so, Formula 3 A Record of 500-cc Racing, will be greatly welcomed. This book gives the story of the difficulties experienced by the pioneers and the entry into the sport of many well-known racing drivers. It recounts the results and times of numerous meetings with a first-hand account of actual racing by C.A.N. May (well known as an author as well as a Trials' driver). Mr. May entered the sport in 1949 and tells first-hand experiences in his own most readable manner. He traces the rapid progress of half-litre racing from its inception in 1946 in a way which will appeal to all who wish for a greater insight into this the most thrilling of all sport. Price 15s 0d. More items related to motoring in the 1950's can be found in the Motoring Collectables section. Articles relating to motor racing in days gone by can be found on this page.